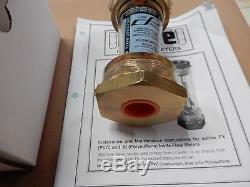 THIS LISTING IS FOR ONE NEW COLE PARMER FLOWMETER. 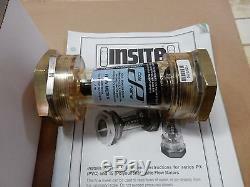 Cole-Parmer Inline Air/Water/N2 Flowmeter, 50 GPM, 1 NPT(F). Spring-loaded indicator allows inline mounting in any position. Nonreactive wetted parts are ideal for applications requiring a high level of purity. Direct readinghas English and metric scales. Spring-loaded, no-float design means these versatile, economical meters do not depend on gravity for accurate readings. Mount in any position in your flow line. Straight pipe runs are not required before or after the flowmeter. Pressure drop is only 4 psi full scale. Flowmeters feature a knife-edged piston for easy reading which remains visible even through cloudy liquids. Working parts are easily removed for maintenance. Ideal for general water and air applications, including process water and cooling water lines. Flowmeters feature direct reading scales for water in GPM and LPM, as well as for air (at 90 psi) in scfmand SLPM. 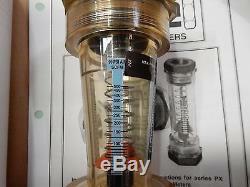 Variable Area, Direct Reading Flowmeter. Max operating temperature (º F). Max operating temperature (º C). ±5% of full scale flow. Pressure drop at maximum flow (PSID). 7"H x 3" dia. 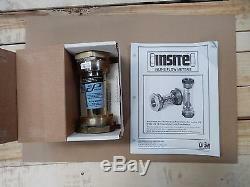 The item "COLE PARMER 32211-24 INLINE AIR, WATER, N2, FLOWMETER 50 GPM 1 NPT(F) NEW" is in sale since Wednesday, February 25, 2015. This item is in the category "Business & Industrial\Hydraulics, Pneumatics, Pumps & Plumbing\Pump & Flow Controllers\Flow Controllers & Meters\Flow Meters". The seller is "anaexcess" and is located in King George, Virginia. This item can be shipped to United States, Canada, United Kingdom, Mexico, Germany, Japan, France, Australia, Denmark, Romania, Slovakia, Bulgaria, Czech republic, Finland, Hungary, Latvia, Lithuania, Malta, Estonia, Greece, Portugal, Cyprus, Slovenia, Sweden, South Korea, Indonesia, Taiwan, South africa, Thailand, Belgium, Hong Kong, Ireland, Netherlands, Poland, Spain, Italy, Austria, Israel, New Zealand, Philippines, Singapore, Switzerland, Norway, Saudi arabia, Ukraine, United arab emirates, Qatar, Kuwait, Bahrain, Croatia, Malaysia, Chile, Colombia, Costa rica, Dominican republic, Panama, Trinidad and tobago, Guatemala, El salvador, Honduras, Jamaica.